A triumvirate of Universities has pooled their collective knowledge to create AQUA, an amphibious robot, as well as the AQUATablet – a way for the robot to get out and live underwater life on its own. The standard operating procedure for most deep-sea robot diving and recovery missions is to suit up the robot, attach a tether control cable, and let it got for dip. Sure, it works in principle, but the trouble is that once the rambunctious robot arrives at the sea floor, changing conditions may force it into a situation where quick and decisive moves are needed. Thanks to the fact that the operator is substantially removed from the robot, these lightening fast moves are more like punching out of a paper bag filled with molasses. Seems like a solvable problem, right? Just slap down some wireless communicators and away you go. New problem: water tends to mess with modem signals, sending them hither and yon throughout the liquidy landscape. This had left diving teams with a conundrum – either tether the ‘bot and hope for the best, or deal with patchy and possibly dangerous modem compunction. Along came scientists from York, McGill, and Dalhousie Universities - a trio of Canadian knowledge powerhouses - and the creation of the AQUA robot and Tablet to fill a gap in the market. 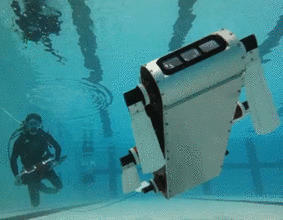 The AQUA ‘bot itself looks like a thin, rectangular otter with small “fins” at each corner instead of arms or legs. The AQUATablet, meanwhile, is an aluminum composite covered in acrylic, which makes it watertight up to 60 feet. From the Tablet, divers can command AQUA using switches and screen prompts, and the robot can be sent 30 to 40 feet below a diver to carry out its work. If more precise movement is needed, a thin optic cable can be attached and the control used positionally – move the Tablet right, and so goes AQUA. Other diver-robot hybrid methods have included using laminated flashcards to talk to the underwater machines, but resulted in sporadic performance and a frustrating inability on the part of these mechanical miracles to understand that “A” is for “Apple”. natural disaster studies IE Typhoons, Hurricane Katrina.